New things can sometimes be scary, can’t they? A new task is very exciting to me, yet I also often have a sense of fear. I bet children all around the U.S. can relate right now. School will be starting soon. If your child is fearful, how can you help? 1. Let them know it is okay to be afraid, but they still have to display courage and go to school. Joshua 1:9 “Be strong and courageous. Do not be terrified, do not be discouraged, for the LORD your God will be with you wherever you go.” For kids who struggle with negativity I would probably phrase the verse this way “Be strong and courageous, don’t be afraid, be encouraged God is with you.” The less negative things you give them to be scared about the better. 2. For younger children, read the “The Kissing Hand” story book and put on some bright lipstick and kiss the inside of their hand so they can “take your love” with them all day. 3. Pray like crazy. Find a Moms in Prayer (www.momsinprayer.org) group to join. That way you can pray every week with other believers for your child and their school. If you are in the Concord, NC area feel free to stop by Pitts Baptist Church and pray with other parents on the first day of school, August 27 from 6:30- 12:00, corporate prayer form 12:00 -1:00 p.m. Check out www.pbcweb.org for more details. 4. Do a test run. Prior to the night before school gets started layout clothes to put on, get up early and run through your routine. Get up at the right time, put on your school clothes and go out for breakfast or make a special breakfast and get your day started early. Make it special. It will help your kids establish their routine. Remember that routine is good for children. 5. 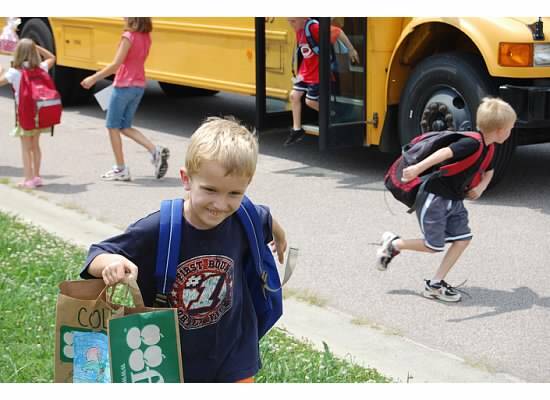 Let older children make decisions on what to wear and what to pack for lunch. The more they play a part in the decisions the more willing they tend to be to complete the task. 6. Remember to encourage them. The preview for the Odd Life of Timothy Green has a great quote concerning school. The dad tells Timothy to “Have a great day!” The mom says it’s “too much pressure” so the dad changes it to “Have the day you have!” No pressure there. Older kids can accept the truth that the more you put into your day the better it is. Encourage them to give it their best effort. Remind them of the fun they have had in the past and how good it will be to see old friends. Younger kids just need to know that you love them and when they will see you again. Give them your best smile and walk away as quickly as possible. The teacher will call you if there is a problem. Assume that good things are happening. I know the start of the new year can be daunting. Let’s face it none of us likes homework and change can be hard. But remember this might just be the best year your family has ever had. Be positive, be proactive, be encouraging. If you are fearful about the year your child will pick up on it and be fearful. Therefore, focus on the positive and be thankful for the beginning of something new. Don’t forget to be abundantly His!